The research for this book was conducted using a qualitative approach. Qualitative research is “characterized by the search for meaning and understanding, ” which uses the “researcher as the primary instrument of data collection and analysis” (Merriam, 2002, p. 6). The researcher uses an “inductive investigative strategy” to complete “a richly descriptive end product” (Merriam, 2002, p. 6). 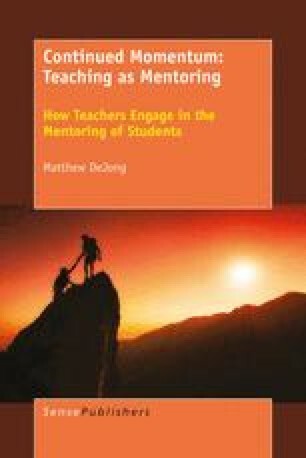 As the broader notions of teaching and teacher are considered through understanding how teachers mentor students, a qualitative approach better serves to capture the nuances and complexities inherent in present day secondary schools.